Urinary stones are increasing in children, primarily during adolescence. Although urinary stones are often viewed in the context of intermittent stone events, increasing evidence indicates that stones are a metabolic process associated with chronic kidney disease and cardiovascular disease. These aforementioned stone-associated conditions may have pediatric origins. To compare urine inflammatory markers in otherwise healthy stone forming children versus matched controls. Urine samples were collected from 12 adolescents with urinary stones along with 15 controls. The levels of 30 urine cytokines were measured using a Mesoscale 30-Plex Human Cytokine panel and normalized to urine creatinine levels. Macrophage inflammatory protein 1β and interleukin 13 levels were significantly elevated in the urine of the stone forming adolescents compared to controls. Interleukin 17A was elevated in the urine of controls. 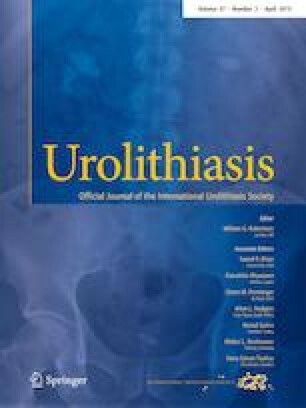 This study indicates that urine levels of cytokines involved in chronic inflammation and fibrosis are elevated in urinary stone formers as early as adolescence. Because stone formers are at risk for chronic kidney disease, macrophage inflammatory protein 1β and interleukin 13 represent investigative targets. The online version of this article ( https://doi.org/10.1007/s00240-019-01133-1) contains supplementary material, which is available to authorized users. This study was funded by intramural funds from The Research Institute at Nationwide Children’s Hospital and Indiana University (Grant no. intramural funds). Andrew Schwaderer has received funds for consulting for Allena Pharmaceuticals on a topic unrelated to this manuscript. Written informed consent and (for minors) written informed assent was obtained from all individual participants included in the study.